This cover will be custom tailored using your specifications. You choose the color and specify size. Since Custom covers are created from scratch, we can offer additional colors. The cover will be manufactured and we guarantee it will be shipped within 2-3 business days. Since this is a custom order, we will need some accurate information from you. Make sure to check out our Measurement Chart for a proper fit. If you would like to add your favorite logo or team please upload a file and we will place it on the cover. Maximum size is 14″ x 16″. We cannot refund any cover purchased with a logo print. Protect your High Definition Television from dust, debris, fingerprints,moisture, wind, etc. with a handcrafted protective cover for your TFT/ Flat Panel type Televisions. 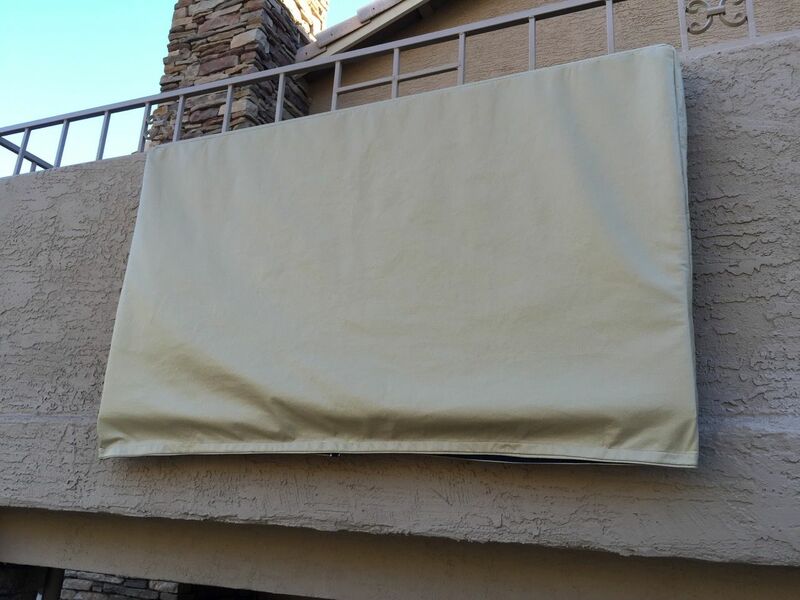 Our covers provides excellent protection for any indoor or light outdoor use. TV’s are created in a wide variety of shapes and sizes. Some have large speakers, includes a DVD, or decorative molding. These may fall out of the fitment for our universal cover. A custom cover addresses this. Fits all variations of wall and ceiling mounts. Customs Orders are made to fit like a glove. Single-pull tightening system, Easy to Reach, tighten using a combination of a durable cord and grommets. Long Life product – This will outlast your TV! Soft on the Inside! Synthetic Cotton polyester inner lining. Non-organic materials (All Material- even the thread!) protection against mold in humid climates. Non Pourous Material. Excellent water resistance. We are on many ships and boats. UV protected. We are based in Arizona! You bet this has been thoroughly researched and proven in the Desert. Marine grade Corrosion and rust Resistant Nickel grommet . Don’t except Cheap imitations, we have the original Patent Pending design. This is a Smartly designed cover that looks great in any environment.